I am not a pessimistic person. On the contrary, I always try to look at the bright side of life. I also believe that living conditions are now better than years ago as these plots show. But reducing the complexity of our world to just six graphs is riskily simplistic. Our world is quite far of being a fair place and one example is the immigration drama. Last year there were 934 incidents around the world involving people looking for a better life where more than 5.300 people lost their life o gone missing, 60% of them in Mediterranean. Around 8 out of 100 were children. The missing migrant project tracks deaths of migrants, including refugees and asylum-seekers, who have gone missing along mixed migration routes worldwide. You can find a huge amount of figures, plots and information about this scourge in their website. You can also download there a historical dataset with information of all these fatal journeys, including location, number of dead or missing people and information source from 2015 until today. 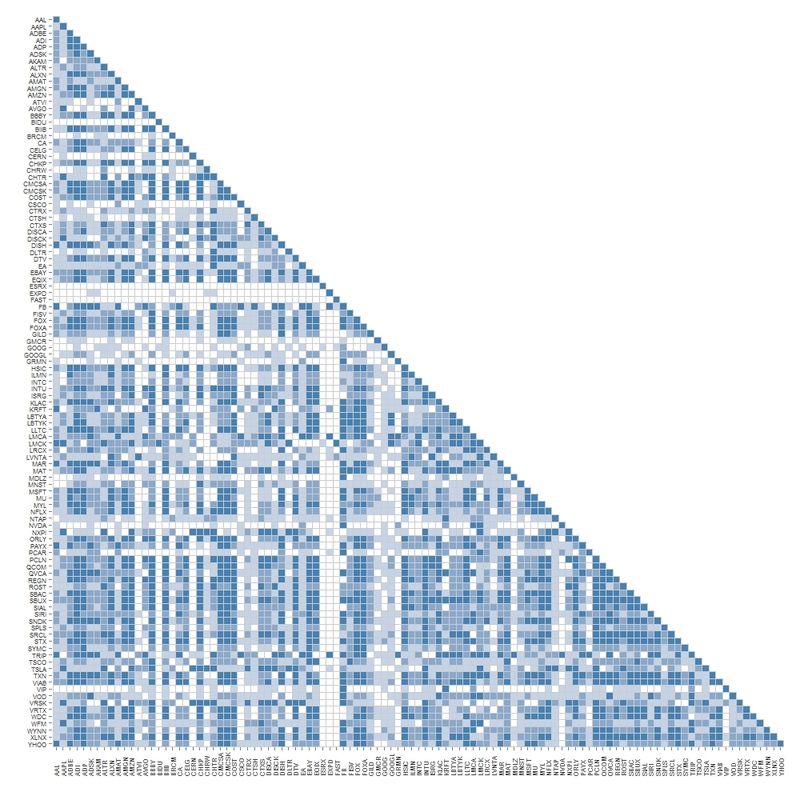 I this experiment I read the dataset and do some plots using highcharter; you can find a link to the R code at the end of the post. Good news: trend is decreasing for last 12 months. Regarding seasonal component, incidents increase in April and May. Why? I don’t know. Every of us should try to make our world a better place. I don’t really know how to do it but I will try to make some experiments during this year to show that we have tons of work in front of us. Meanwhile, I hope this experiment is useful to give visibility to this humanitarian disaster. If someone wants to use the code, the complete project is available in GitHub. Last September, the British government announced its intention to pursue what has become known as the Alan Turing law, offering exoneration to the tens of thousands of gay men convicted of historic charges. The law was finally unveiled on 20 October 2016. Last plot shows the accumulated effect. After 141 days, there have been around 1 million of incremental views to the Alan Turing’s wikipedia page (more than 7.000 per day) and it does not seem ephemeral. Alan Turing has won another battle, this time posthumous. And thanks to it, there is a lot of people that have discovered his amazing legacy: long life to Alan Turing. 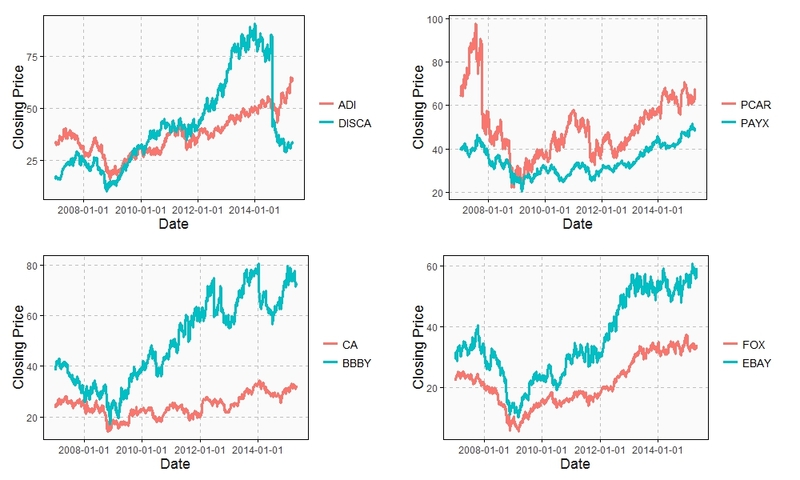 Analyzing the evolution of NASDAQ-100 stock prices can discover some interesting couples of companies which share a strong common trend despite of belonging to very different sectors. The NASDAQ-100 is made up of 107 equity securities issued by 100 of the largest non-financial companies listed on the NASDAQ. On the other side, Yahoo! Finance is one of the most popular services to consult financial news, data and commentary including stock quotes, press releases, financial reports, and original programming. 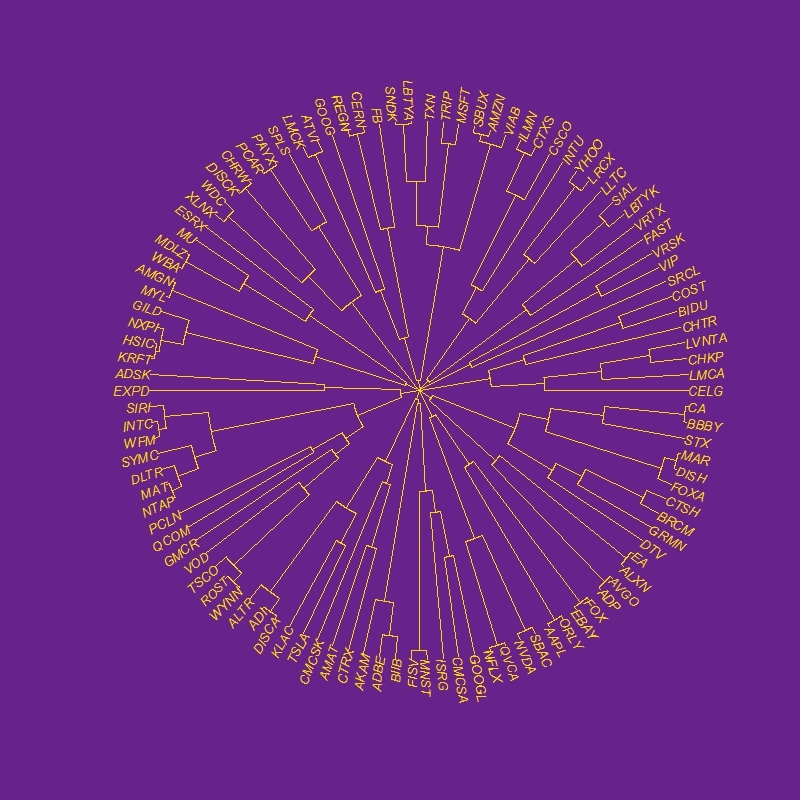 Using R is possible to download the evolution of NASDAQ-100 symbols from Yahoo! Finance. There is a R package called quantmod which makes this issue quite simple with the function getSymbols. Daily series are long enough to do a wide range of analysis, since most of them start in 2007. One robust way to determine if two times series, xt and yt, are related is to analyze if there exists an equation like yt=βxt+ut such us residuals (ut) are stationary (its mean and variance does not change when shifted in time). If this happens, it is said that both series are cointegrated. The way to measure it in R is running the Augmented Dickey-Fuller test, available in tseries package. Cointegration analysis help traders to design products such spreads and hedges. Analog Devices Inc. (ADI) makes semiconductors and Discovery Communications Inc. (DISCA) is a mass media company. PACCAR Inc. (PCAR) manufactures trucks and Paychex Inc. (PAYX) provides HR outsourcing. CA Inc. (CA) creates software and Bed Bath & Beyond Inc. (BBBY) sells goods for home. Twenty-First Century Fox Inc. (FOX) is a mass media company as well and EBAY Inc. (EBAY) does online auctions‎. All of them are odd connections. There are about 6.500 available packages in CRAN repository. If I were a superhuman, able to learn one package a day, I would spend almost 18 years of my life studying R. And how many packages would be uploaded to CRAN during this period? Who knows: R is infinite. 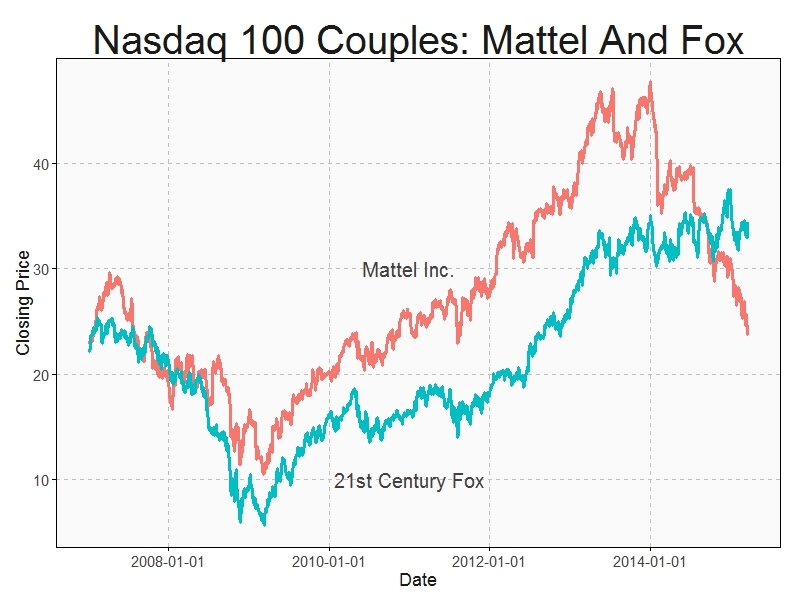 These two companies have been dancing cheek to cheek for more than seven years. 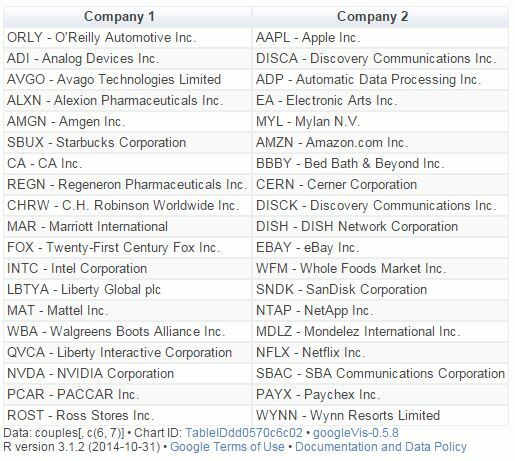 It is also curious how some companies are far from any of their NASDAQ 100 colleagues. Some examples of these unpaired companies are Express Scripts Holding Company (ESRX), Expeditors International of Washington Inc. (EXPD) and Fastenal Company (FAST). I do not why but there must be an explanation, do not you think so?